We have several really good winter venues to fish over the next few months and it looks as if the River Welland through Spalding could well rival a few after a small open match on it last weekend. Ray Malle found a huge shoal of roach willing to feed on his pole and bread punch attack and topped the field with a magnificent 52lb 12oz. John Southgate had a fine 35lb 10oz, then came John Price on 24lb 11oz. 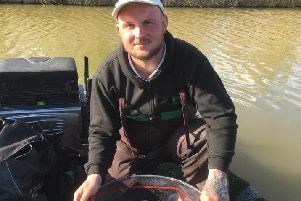 The Carrott Wash section at Pondersbridge was the venue for the latest Whittlesey club match on Saturday which saw match organiser Jeff Tuttlebee put in a fine performance on the waggler fishing pinkie over a little groundbait to finish well clear with 7lb 2oz. Runner-up was John Taylor (6lb 1oz) and third Arthur Smallman (5lb 14oz). In the regular Wednesday Over 50s match on Two Islands, Bill Boone took the top spot with 37lb 9oz from peg 24, all his fish falling to feeder tactics. Second was Chris Thickpenny with 20lb 2oz. The fishery are still running Monday open matches too. This week it was Vince Hull on the Wagtail taking the honours, fishing pellet and sweetcorn from peg eight for 35lb 5oz. Gus Gausden came second with 26lb. Despite the frosty weather some fine weights were recorded at Buttonhole Fishery. Out in front with 61lb 10oz of carp from peg 21 was Mick Wright, a seasoned angler with a good knowledge of winter fishing. Runner-up was Peter Harrison with 42lb 7oz. Rookery Waters Mainline Match Teams Of Three: Jay Lake - 1 Guy Dew 120lb 1oz; 2 Dave Rawlings 87lb 7oz. Magpie Lake - 1 Rab Egan 99lb 4oz; 2 Simon Easy 64lb 10oz. Raven Lake - 1 Darren Ogden 57lb; 2 David Adams 40lb 5oz.